This Easter Saturday 19th April, Flat Iron restaurant in Soho (which started life as a pop-up), is roasting an entire Ox at The Ship pub by the river in Wandsworth. Tickets are £12 which get you some of the ox, plus a jacket potato and a pint of London Stout, are being sold by the hour, and some hour slots have sold out already. Hurry! "Sometimes we take on a challenge. This is a pretty big one. It was Charlie Carroll’s idea. Charlie is founder of Flat Iron, the steak restaurant in Soho specialising in undervalued ‘butchers’ cuts of great quality beef. He sources his meat from a third generation beef farmer in North Yorkshire, who specialises in rare breed cattle. Charlie proposed an ox roast. 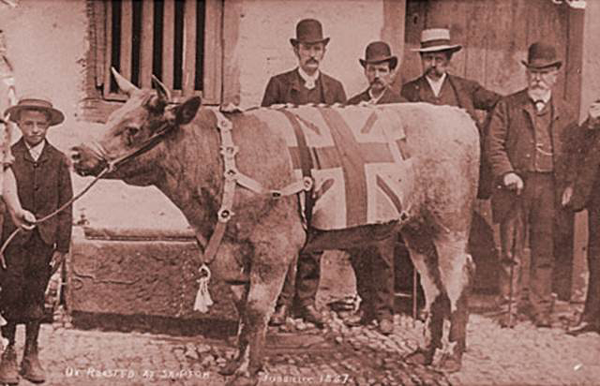 As far as we can gather, an ox roast has not been done in London since the 50s, although they were very popular in Victorian times. So, Charlie has chosen a 250kg longhorn steer, which is currently on a finishing diet including 150 pints of London stout. We intend to roast the whole animal on a specially designed spit at The Ship on the week of 14th April, for sale on Easter Saturday 19th April. The ox will be sold in advance. A portion, including jacket potato, a salad and gravy, accompanied by a pint of London Stout is £12 plus the eventbrite commission."